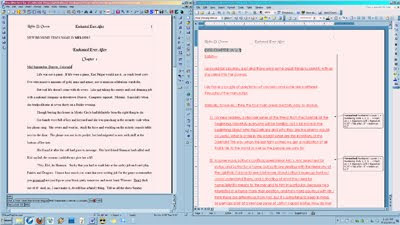 Long, Hot Days of Summer Editing: I've gotten the edits for Enchanted Ever After and will start on the long days of revision now. I like to do them in as few days as possible so I stay in that world. Though I may be going down to my local coffee shop (the Sensitive New Age Bean in the Mystic Circle books), or the local deli, where it's cooler, to work. Or moving up and down stairs...new "desktop" (a loaded notebook) to laptop (actually larger than the desktop). Supposed to be about 102 degrees today, falling down to, maybe, 97 in the next week. See you on the other side. 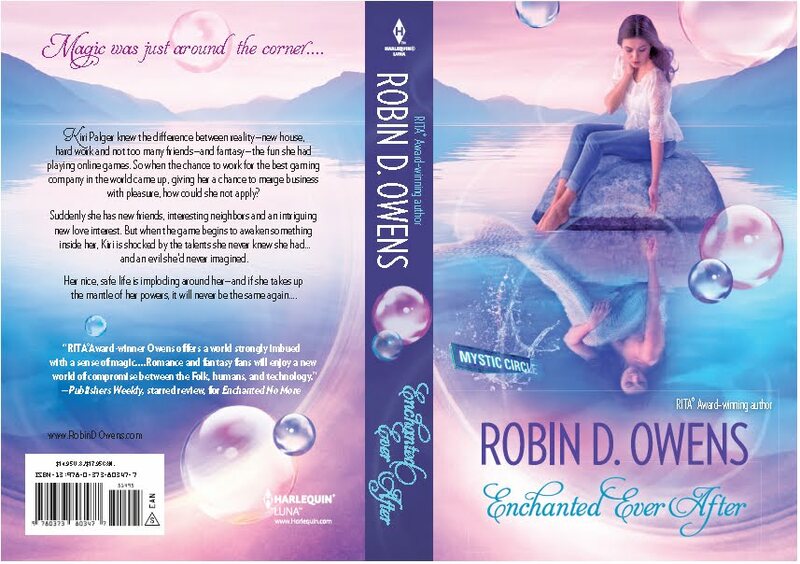 And for hanging in there with me, you get two pics, one of the editing process on my huge monitor, and one of the cover of Enchanted Ever After, which is pastel. The cover has an ethereal feel to it. The colours are lovely, they suit the way Kiri is dressed, especially that diaphanous top. I also like that the reflection is not a mirror image. Her feet arched into the water look like a ballet dancers, in perfect position to turn into a tail. I really like this cover of your next book. I love the ethereal feel of the cover, the colors, the calmness. One of the better covers, I think. Thanks! I am glad you three commented on it. The cover was feeling very pastel to me. And I got the cover art with a different pose and in underwear, so I'm glad she's better covered! Robin, I have to tell you that I have been coming back every couple of days to looks at this cover. I have never done that before with anyone else's cover, but, there is something about this one that I really like. Tine, I'm glad that you like it. I'll cut the front and put it up in a while so you can see the pic better.